So proud of my Errant Easel ladies! Staci has been blogging up an introspective storm and D3Z has been busy working out and being the “hostess with the most-ess.” Work has been extra busy this January but I’ve been trying to balance the (always enjoyable) science with EE-worthy pursuits. Luckily there is no judgement at Yarn Church since I was headed to the gym afterwards. Most of my creative time in 2013 has been spent knitting and particularly a free pattern of fingerless mitts that caught my attention on Pinterest. The Swirling Gauntlets were designed by Susana IC and she has a number of free patterns on her website I am interested in trying. The traveling cables look really nice when you finally get this pattern right. It’s a quick and satisfying project I’ll probably use for some gift items this year. I’ve finished the first pair using Classic Elite Woodland Yarn that is 65% Wool and 35% Nettles. According to Classic Elite, nettles are eco-friendly because they can be grown in poor soil conditions without the use of chemicals. While I haven’t had any memorable encounters with the infamous stinging nettles, this makes sense to me because it is a type of plant that comes early to an area with disturbed earth like a plowed field. Already the mix of animal and plant fibers are wanting to felt slightly and form a nice warm fabric that will blend nicely once it’s blocked. The yarn is also lightly heathered from the different dying properties of animal and plant fiber, a property of fiber I had not really considered. Sarah is working on her Fair Isle Hat and I am casting on my second pair of wool mitts. I took this pattern to my aunt’s annual Knitting Camp we have at her house every year in January and finished the second at our newly established Yarn Church which meets every Sunday at 11:30 at rotating coffee shops in Lexington. I loved my annual get together with my aunt which involved lots of coffee, good food, Downton Abbey, and creative projects. It’s also been a really good thing for me to have a weekly appointment to knit because I’m more motivated to work on my projects through the week so I have some progress to show by Sunday. Seeing my friends’ progress and ideas opens me up to trying new techniques and makes me think more about the process as a whole. 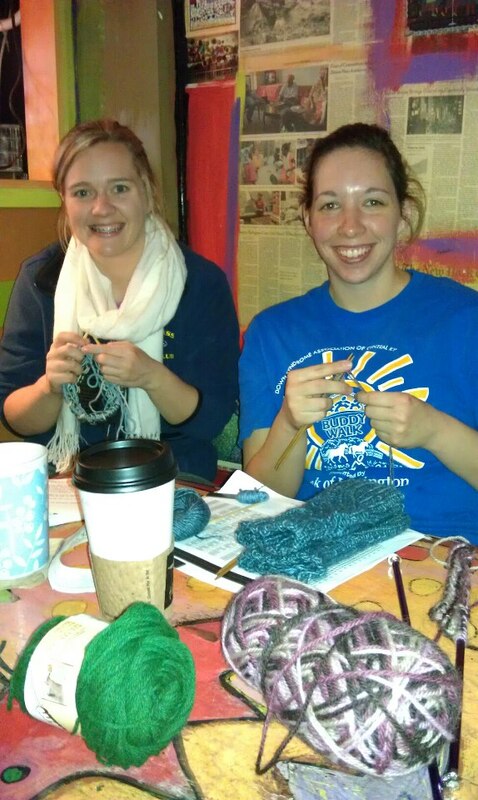 Rebecca and I recently tried to teach a new left-handed friend to knit the left-handed way and the inherent differences really blew our minds. 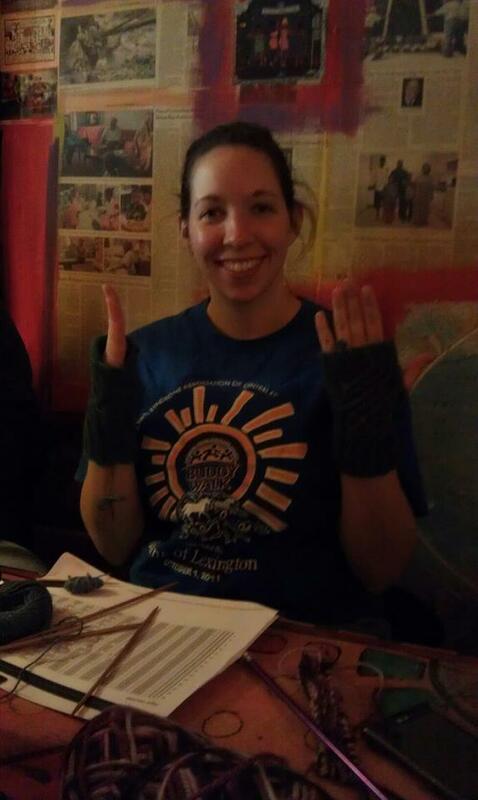 Luckily our exprienced lefty knitter friend Amanda was able to intercede and keep us from leading Ali further astray. All interested parties, new or experienced, are welcome at Yarn Church and we will teach you to knit or crochet depending on your interest. I don’t know about other knitters out there, but when the ideas are rolling in, I get so many projects going I have to force myself to finish a few just to have at least one complete work to show for all of my efforts. I deemed last night the point at which I should cast off a few projects before I start my next big adventure. 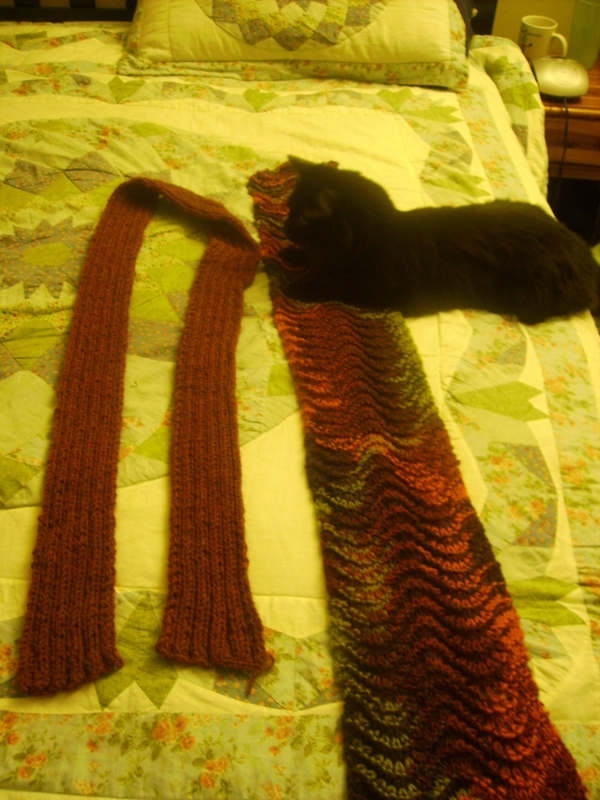 First, I finished knitting my Paton’s Classic Wool Harvest feather and fan scarf. This project was my personal introduction to the most basic of lace. I’ve decided I really like the increasing and decreasing but if I knit this pattern again, I will be using a lighter weight yarn. The Classic Wool added a bulk that will be beneficial in the fall and early winter but I would like to try a nice delicate lace for spring next. 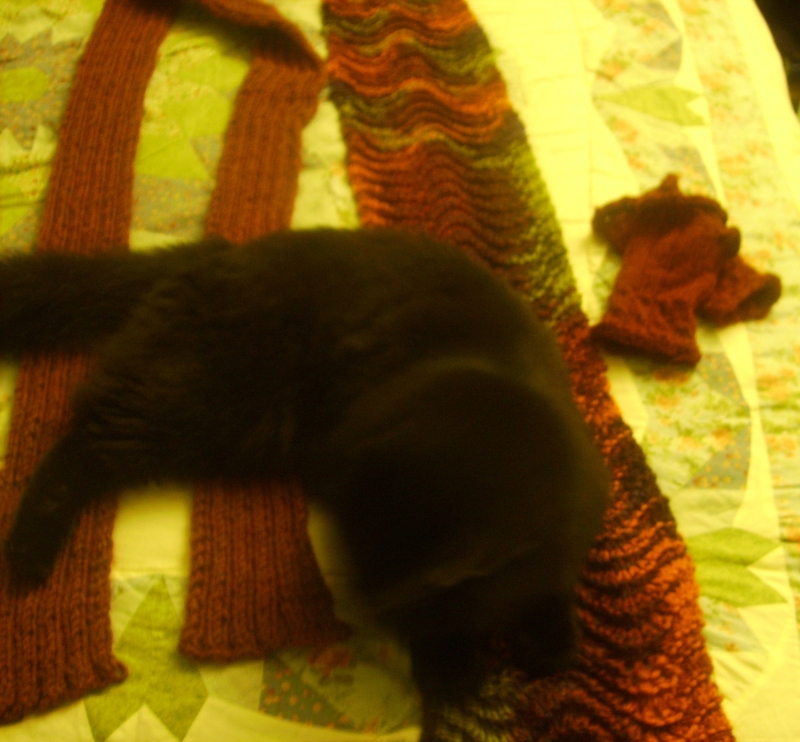 Next, I set down to repair one of my first ever completed knitting projects. This ribbed scarf made me so proud when I finally cast off. Unfortunately, though I filed it under complete, it evidently wasn’t done properly as it began to unravel from the “bound” end some time later. I was pretty worried about being able to repair this piece. I have not mastered picking up dropped stitches and had chosen to not examine the damage too closely, assuming the worst. Last night, I finally convinced myself to pick it up and see if I could undo the damage. I think only one stitch had been dropped and I was able to retrieve it with minimal fuss. Finally, it was time to face the dreaded picot cast off and peasant’s thumb of the second fingerless mitt I had started but never finished under the tutelage of my Aunt Jane. I procrastinated finishing this project for some time, first because I doubted my ability to figure out the picot and thumb on my own and later because I temporarily misplaced the first mitt my Aunt so painstakingly walked me through knitting. However, like most things it eventually resurfaced in one of my many project bags and it was time to cast off. It turns out, in the absence of a (might as well be) master knitter like my Aunt, the most helpful aid in knitting is YouTube. End of story. Google any knitting technique and there are tons of resources at your fingertips. This is the video I used to figure out the picot bind off. Even though I’ve completed three projects this week, I have tons of ideas for what is next. There are the House Hats, a number of sharp looking cowls, and a budding wedding gift collection. Stay tuned for details!